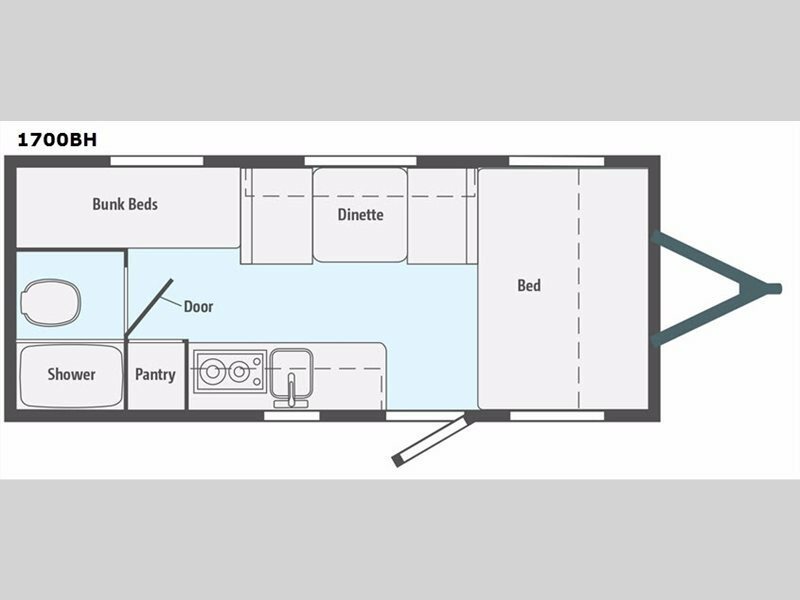 2017 Winnebago Industries Towables Micro Minnie 1700BH, This Micro Minnie travel trailer model 1700BH offers a rear bath layout, a set of bunk beds for the kiddos, and so much more to make your travel time away enjoyable!Enter and notice a bed across the front of this unit. You will also find storage in the overhead cabinet the entire width of the unit as well. Straight in the door enjoy being seated at the booth dinette for meals, or when playing a board game or two. Here you will also find added overhead storage so you can keep things neatly tucked away. To the left of the entry door is your kitchen area. Prepare and cook light meals and snacks with the featured two burner stove top, a single sink, plus pantry for food storage. There are also cabinets and drawer space for your dishes and things.The rear of this unit offers a set of bunk beds that the kids will love sleeping in, and a convenient bath is located right next door providing you with a shower and toilet which makes camping even more comfortable, plus so much more!